Home > Tort reform > Are there frivolous lawsuits? The other day, a woman who sells healthcare insurance made a casual comment to me about how insurance rates are affected by frivolous lawsuits. Let’s be clear. There are two kinds of medical malpractice claims: those that settle or go to trial and the plaintiff wins, and those that are defensible and are taken to trial, and the defense wins. 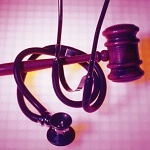 About 3-5% of all medical malpractice claims are taken to court. I explained to this woman that a defensible claim is not necessarily frivolous. There are any number of reasons why a claim is defensible. For example, there are two schools of thought on how a patient should be cared for, and the provider selected one of these two acceptable treatment methods. Or the standards of care were followed, but the patient had a bad outcome. It often takes the skills of an expert witness to determine if there is a link between the actions of the healthcare provider and the ultimate outcome. I explained to this woman that potential cases are carefully screened. A busy plaintiff attorney’s office might get several calls a week, and reject 95% of the cases due to lack of liability, lack of damages, or lack of causation. Our company’s nurses and physicians have evaluated hundreds of cases over the years, and have found that some of the cases that have gotten through the preliminary screening by the plaintiff firm are without merit when an expert has reviewed them. Expert witness conclusion that a case is non meritorious acts as a wall to further pursuit of a claim by a plaintiff. I explained to this woman that it is way too expensive to take on a case that does not, at least on the initial evaluation, look like it has merit. It is costly to order records and pay for experts. Many families do not have the funds to foot these costs, so the plaintiff firm has to take on the expenses. It is increasingly difficult to find physicians willing to act as experts for the plaintiff. Some have been told by their hospital that they are not permitted to review cases for the plaintiff. Some are discouraged by their professional societies. See http://tinyurl.com/lwgfxp. Many states require a specialist in the same clinical area to review a claim and file an affidavit of merit before a case can go forward. I do not see frivolous cases being filed. Now, the government is tackling the difficult and complex task of trying to fix the healthcare system. A recently released study by the Americans for Insurance Reform (AIR) explored the question of whether the need to provide affordable healthcare insurance should be linked to restricting people’s access to the medical malpractice litigation system. What follows is a summary of their key findings. The full report can be accessed here. Let’s keep the focus of healthcare insurance reform on bringing affordable healthcare to those without and those who are underinsured. Let’s focus on saving patient’s lives and preventing medical errors that kill and maim patients. In discussions about how to solve our vast national health care crisis, questions are often raised about why the system is so expensive and how costs can be reduced to make health care affordable for everyone. Some of the discussions have focused on medical malpractice insurance and liability issues, raising questions about the cost of insurance for doctors and whether there is a need to further limit patients’ ability to bring claims against incompetent doctors or unsafe hospitals. Medical malpractice premiums, inflation-adjusted, are nearly the lowest they have been in over 30 years. Medical malpractice claims, inflation-adjusted, are dropping significantly, down 45 percent since 2000. Medical malpractice premiums are less than one-half of one percent of the country’s overall health care costs; medical malpractice claims are a mere one-fifth of one percent of health care costs. In over 30 years, premiums and claims have never been greater than 1% of our nation’s health care costs. Medical malpractice insurer profits are higher than the rest of the property casualty industry, which has been remarkably profitable over the last five years. The periodic premium spikes that doctors experience, as they did from 2002 until 2005, are not related to claims but to the economic cycle of insurers and to drops in investment income. Many states that have resisted enacting severe restrictions on injured patients’ legal rights experienced rate changes (i.e., premium increases or decreases for doctors) similar to those states that enacted severe restrictions on patients’ rights, i.e., there is no correlation between “tort reform” and insurance rates for doctors. AIR concludes that there absolutely no reason to further limit the liability of doctors and hospitals, who already benefit from more liability protection for their negligence than any profession in the country. Further, doing so would have almost no impact on overall health care expenditures – except that the costs of medical error and hospital-induced injury would remain. What do you think? about tort reform? Healthcare reform? Which is more important? If you like this post, DIGGIT and I will write more about the topic. Thanks Pat for this very insightful article. I think the bone of contention is not on the overall financial impact of medical malpractice on the overall healthcare system but the amount of award against individual doctors or practitioners in successfully prosecuted malpractice claims. It is hard to see how a doctor who might have treated thousands of patients over many years with good result but had never made a million dollar is made to pay millions for one mistake. Again the emotional damage to some of the practitioners are enomous. Doctors are practicing defensive medicine to avoid malpractce suits and that certainly does not reduce healthcare cost. I agree that some form of recourse must exist for patients who are injured for no fault of theirs. Rather than put more restriction on malpractice suits, the awards against individual practitioners (not hospitals or health systems) may need review. There are states that limit awards. Some have imposed ceilings and some have removed those same ceilings. The insurance companies back the physicians and pay the awards. Interestingly, in Texas, which limits the awards, the cost of malpractice insurance has not gone down.